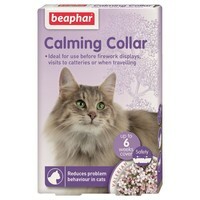 The Beaphar Calming Collar for Cats has been designed to effectively reduce problem behaviour in cats of all breeds, sizes and ages, caused by stressful situations. Infused with a blend of Lavender and Valerian which are often used in human healthcare, the collar will leave your cat feeling calm, settled and relaxed, without having a sedative effect. Once fitted, Valerian will be released immediately and your cat will begin to relax within approximately one hour. 2-Ethylhexyl Diphenyl Phosphite, Linalool, Lavandin Oil. 35cm (13.8") - Can be cut to length as required. This collar features a safety mechanism which allows the cat to slip its head out of the collar if it were to become caught on something..